The militants made 26 ceasefire violations in the ATO zone. Over the past day, Donbass militants 26 times fired at the positions of the Armed Forces of Ukraine in the zone of the antiterrorist operation. On 16 occasions, Ukrainian servicemen returned fire using weapons not prohibited under the Minsk agreements. The press center of the ATO said in a Facebook on Monday that one Ukrainian soldier received a combat injury. The situation somewhat deteriorated on the Luhansk sector where the enemy fired tank and IFV weapons, 120- and 82-mm mortars and grenade launchers in the area of Troyitske. 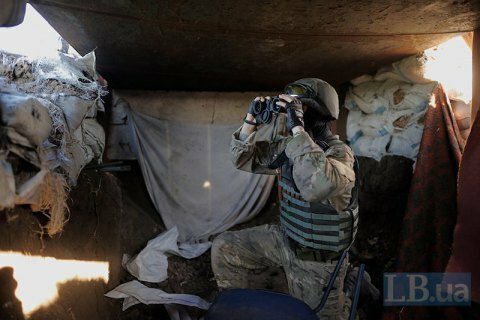 After dark shells, the militants released twenty 152-mm mortar shelles at Ukrainian strong points in the area of Prychepilivka, and fired 82-mm mortars at the defenders of Novooleksandrivka and Luhanska. In the same sector, the enemy also consistently used infantry weapons. The enemy shelled the defenders of Luhanske from IFV weapons, while Ukrainian strong points in the villages of Stanytsya Luhanska, Svitlodarsk, Novotoshkivske, Krynske and Bohuslavke were mostly shelled by rocket-propelled grenades, heavy machine guns and small arms. In the Donetsk sector, the focus of confrontation shifted from coastal area to Avdiyivka suburbs. The Russian-backed terrorists used grenade launchers, heavy machine guns and small arms to fire a few sectors on the outskirts of this front-line city in the Kamyanka area. On Sunday, 19 November, ten enemy instances of enemy shelling were recorded.